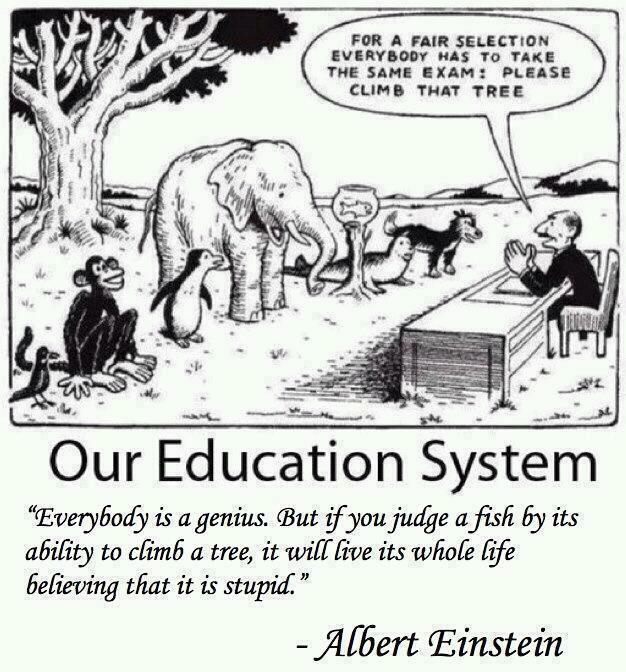 I found this cartoon today and it say’s lots about the state and federal testing and the state of the current educational systems in this country. How we define the valedictorian has nothing to do with creativity and success and intelligence. The current systems are created to sort out students into a rank order, it has nothing to do with creating success. Sign up by August 30, 2013, and Apple will collect any brand of computers and peripherals from your school for free recycling. * Secure and environmentally responsible, the process Apple uses results in a high recovery rate of commodities. And all recycling is done domestically, so you can rest assured that your old electronics won’t be shipped overseas. To learn more about why Apple recycling is good for your school and to register for pickup, visit www.apple.com/education/recycling or call 408-862-0008. This is a site to teach a crash course on many subjects. Here is an example of a Crash Course lesson. This could be used as an introduction to a course or in flipping a lesson. 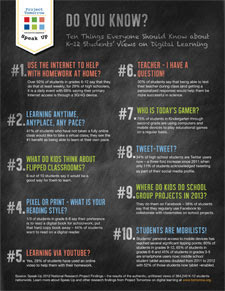 Speak Up 2012 Educator & Parent Report is Now Available for Download! Windows 8 Grows Slow, XP Just Won't Go - CIO.com: "Windows 8 Grows Slow, XP Just Won't Go"
Here is an online tool to move your school to digital textbooks. Innovative teaching practices and once unimagined technologies are converging to support transformative learning. Connect with educators and community leaders seeking to gain knowledge and fuel their passion for teaching and learning. Learn how to create environments that equip students with skills to be involved citizens—thinking, planning and acting—to change their world today and tomorrow. Featured presenter: Kevin Honeycutt, is a technology integrationist and staff developer from Central Kansas. He spent 13 years teaching K-12 art and now travels the country and the world shares ideas with forward-thinking educators. Over 40 breakout sessions to choose from. Among the presenters are representatives from Google, Discovery Education and LEGO Education. Feel free to share this link on Facebook, Twitter and LinkedIn. For difficulties with the listserv, please contact smitha24@michigan.gov. 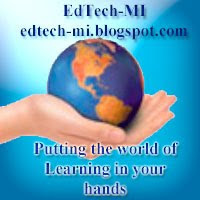 State Superintendent Mike Flanagan welcomes YOU to the Education Technology Work Group. TED Talks Education, hosted by John Legend, premieres May 7, 2013 at 10/9 c on PBS. Public television and TED, the non-profit organization devoted to Ideas Worth Spreading, share a deep commitment to addressing the high school dropout crisis. The TED Talks Education one-hour program brings together a diverse group of teachers and education advocates delivering short, high-impact talks on the theme of teaching and learning. These original TED Talks are given by thought leaders including Geoffrey Canada, Bill Gates, Rita F. Pierson and Sir Ken Robinson. TED Talks Education is part of the Corporation for Public Broadcasting’s American Graduate initiative. Watch TED Talks Education Preview on PBS. See more from TED Talks Education. Do you know that kids who eat breakfast are 20% more likely to graduate from high school, average 17.5% higher in math scores, and attend more school days per year? · Greater student participation in your Breakfast Program can increase federal funding to a school district. · Creating eating programs that encourage students to take grater advantage of hot lunch programs can have am important role in the solution of childhood hunger. If we know these statistics, then why are we not working harder to give the children the time eat well. Encouraging them to eat instead of other competing activities We spend tons of times trying to figure out how to increase student learning. Some of the answer may be as simple as making a good hot breakfast and lunch that they will eat, and giving them the time to eat it. The human brain might have gotten a giant upgrade in capacity. Let's leverage that! This is my keynote for the K-12 Online Conference. http://k12onlineconference.org/ This powerful learning opportunity is powered by amazing thinkers and classroom superstar teachers!